﻿ 1Step Video Converter - Convert MPEG4, MPEG, DivX, Xvid, WMV, AVI, Tivo, (S)VCD, RealMedia videos and others to iPod, Zune, PSP or 3GP. All your videos will be ready for playback on your portable device in no time. 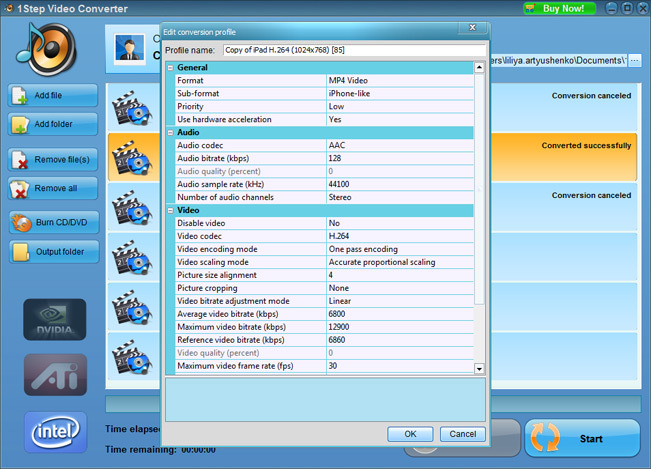 With 1Step Video Converter you can easily watch any your videos on your computer, iPod, Zune, PSP or mobile phone. 1Step Video Converter can produce incredible high-definition files for smooth viewing on Full HD TV screen as well as tiny video clips for a mobile phone or iPod. 1Step Video Converter is your ultimate tool to convert MPEG4, MPEG, DivX, Xvid, WMV, AVI, Tivo, (S)VCD, RealMedia and other videos to your computer, iPod, Zune, PSP or 3GP formats in high quality at high speed. converts to many many popular formats including - DivX AVI, MP4, Windows Media, Flash Video, MP3, OGG, AC3, FLAC, WAV, etc.